I’m Trevor Hyam, a self-trained, full-time barista working in the UK. I am Head Barista and Trainer at the plan Cafe in Cardiff. In 2010 I came 4th in the whole of the UK, in the UK Final of the official UK Barista Championships. Even though that was some years ago now, as of 2018, this currently still remains unbeaten by anyone in Wales, which indicates the significance of the achievement. Essentially I did this single handedly, with just some support from my wonderful wife – I didn’t have a knowledgeable company/cafe/team of people around me to coach me during the process. For me, it was the culmination of several years of learning as a barista up to that point, and a huge achievement. Equally though, it was also just one part of an ever deeper journey into the craft, that has continued and progressed ever since. Looking back, it surprises me to think how little I actually knew then, even as a finalist in the competitions, relative to where I am now. I’ve learned so much since then. The fact is there’s always (a lot) more still to learn, and I don’t think this ever changes with coffee, no matter how far you progress. Not all baristas who do well in competitions are actually available for the humble act of making coffee day-in-day-out for the public (partly because there are many other areas within speciality coffee where we can contribute and move things forward). But, as a barista, what I love is the hands-on craft of actually preparing and serving coffee. And doing so within the focussed environment of just one cafe, full-time, allows me to implement, quality control, and maintain every detail of what we do with coffee. And so, you can come and get a coffee from me, at least 5 days out of 7. And on my days off, someone I’ve trained will be on hand, using the set-up I’ve put in place. Coffee is what I do. It’s my profession, and my obsession! If I’m not making it, drinking it, or training our staff, I’m probably researching it, and thinking *How can I make it better next time? * Every day I’m trying to understand and prepare the coffees that I’m working with ever better; searching for each great bean’s sweet spot, and trying to understand how to deliver it more consistently. At work, for the plan, this revolves around espresso primarily, and also our French Press (cafetières). Whereas at home, I experiment with a whole variety of manual filter brew methods …using my Mahlkonig Tanzania grinder (which I’ve modified to optimise the grind even further for single-dosing use). I have been working with coffee since about 2004, and have been doing what I do at the plan cafe since early 2007. I have been preparing and promoting speciality coffee here in Cardiff, at the plan cafe, and working to continually develop and refine the quality of what we do ever since. We were one of the very first places in the region to continuously offer this type of (Third Wave?!) coffee, prepared with these more involved and fastidious techniques …and to put Flat Whites on the menu. I studied Fine Art at university, graduating in 2000. I continued painting for a while in my spare time, but meanwhile I discovered a keen interest for what I was doing with coffee in the cafe where I was working, which has since developed into a passion. For me, the world of great coffee is easily as challenging, inspiring, complex and rewarding as anything I ever encountered with painting and art (more so, in fact). There are many parallels that can be drawn between coffee and art and some people say that preparing great coffee is an art. I would describe my role more as a sort of craftsman though, utilising skilled techniques, knowledge, and sensory intuition acquired over many years (which ONLY comes with experience). 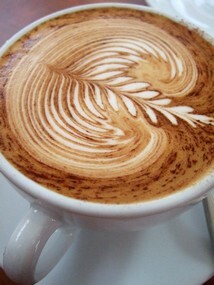 As a barista you develop an intimate feel for the materials you work with, the process, and the end product in the cup. All your senses become tuned to the subtleties of the espresso and the milk, in an attempt to understand their variables and create something great. As mentioned, in 2010, I came 4th in the Final of the UK Barista Championships in London, after competing against many of the UK’s finest baristas in a regional heat, semi finals, and then the top 6 baristas in the Final. The espresso blend I created for the finals was roasted by the awesome James’s Gourmet Coffee Roasters, and was composed of washed coffees from Finca El Carmen in El Salvador (an Orange Bourbon varietal), The Shoye Cooperative in Sidamo, Ethiopia, and two separate varietals (a Typica and a Bourbon) from Finca Santuario in Colombia. After preparing espressos and cappuccinos for the judges, I used my blend to create a Signature Drink which was based around the dessert of Key Lime Pie, which complemented the clean and citrusy flavours that were natural characteristics of the coffee I used. I also competed in 2009, where I won my regional heat (the South West and Wales), and then ranked 12th in the UK in the semifinals. But, clearly, I improved on this even further in my 2nd year competing in 2010, by getting through the semifinals to the Final, and ranking 4th in the UK. For a more concise page about what I do with coffee, there’s also my mini-website: The Bean Vagrant.co.uk. I can currently be found making coffee at the plan cafe, in Cardiff city center (9-5 Monday to Friday, usually), and have been there since March 2007. The plan is a lovely little independent cafe, that was established in 2002. 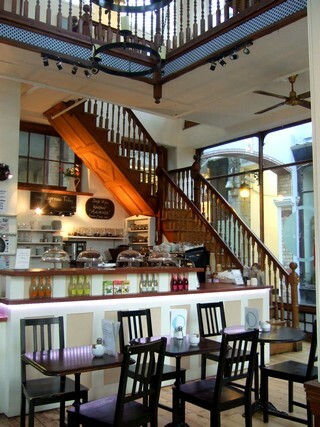 It’s situated in one of Cardiff’s beautiful and unique Victorian arcades, which are packed with original features and which house many small businesses. The cafe serves simple but tasty home-cooked food, prepared with ingredients which are often organic and locally sourced, and there are lots of vegetarian and vegan options too. There’s a small, continually changing selection of In-Season coffees available to be brewed via French Press (Cafetière). The selection for the day can be found on the French Press blackboards, along with tasting notes. There’s also our range of espresso-based coffees, all brewed with my particular choice of beans for that day. These include Flat Whites (a delicious drink that can indicate and communicate great coffee, when made skilfully with great beans!). And, there’s also our (lovely) standard house filter on tap for those just wanting ‘normal’ coffee! Our house espresso is usually a blend of In Season coffees, designed by our roaster. This is what we then use for all our espresso (and espresso-based) drinks on that particular day. All the ingredients of the blend are fully traceable – you’ll be able to see exactly which specific farms or cooperatives are being used. The components of the blend will change seasonally, as new crops replace previous components, and new versions of the blend get released. Check the Espresso blackboard to see EXACTLY where your coffee is from today! Occasionally, I might select a differerent coffee from our roaster for the espresso of the day, such as a Single Origin espresso from one single country, or a Single Origin Micro-Lot, from just one part of one single estate, or even a coffee for espresso from a guest roaster. I used to switch coffees and roasters constantly, which is something that’s become fashionable now. But I’ve been there and done that! And I have actually moved away from that now, choosing instead to focus almost exclusively on one great In Season blend that I love, from a roaster that I’ve settled on because I enjoy and respect what they do immensely, and because what they do is consistently exceptional. This allows me to develop more intimate knowledge of the blend, and be more precise and consistent in what we offer. The plan is a sizeable cafe which also serves a lot of food, and it is therefore not a small ’boutique’ espresso bar that can concentrate solely on the coffee, as such. The desire to produce truly great coffee was not the original focus of the cafe; it’s more an aspiration that I’ve brought with me, and which I have strived very hard to gradually nurture, and constantly progress, since I arrived in 2007. Naturally this makes for lots of challenges when attempting to develop, produce, and sustain wonderful, artisan-style coffee amongst everything else we do. But, through a genuine passion for what I do, and a HUGE amount of dedication to developing and maintaining standards, and training staff, we have gradually earned a great reputation for the coffee side of things in particular. There are lots of things that make the cafe great, but the most notable publicity that we have received throughout the UK, and beyond, has been generated more specifically from what I have done with coffee, both in the UK Barista Championships, and also continuously at the cafe itself (such as our inclusion in the Independent’s 50 Best UK Coffee Shops, The Sunday Times 25 Best Coffee Shops in the UK 2017, and The Telegraph Britain’s 30 Best Coffee Shops 2017). My role as Head Barista and Trainer. As Front of House Manager and Head Barista, I am involved with all the general day-to-day management of the cafe as a whole, along with the owners. However, obviously, it is my role with the coffee specifically, as Head Barista, that is my particular speciality and passion. Part of what I do as head barista and trainer for the cafe is about training our staff. It’s not just about me making the best coffee I can – it’s also about me training all our staff, so that they can all consistently prepare coffee to a high level for our customers, and have the opportunity to serve coffee that approaches what I prepare myself. All barista training at the plan is provided by myself, exclusively. This ensures that each member of staff benefits from the highest level of expertise, experience, and consistency that we can offer. Once a staff member is trained and proficient with all the more basic aspects of the cafe’s system (usually a few weeks), I might decide to progress them further with espresso training, if they seem suitable, and if they have done some research into what we do with coffee. They do not prepare espresso drinks for our customers at all, until after full training. If I do progress them onto this training, I firstly provide several initial intensive training sessions over a few days, covering all the key aspects of the craft, the coffees we use, the equipment, and the techniques. There is then a period of practicing these techniques with further guidance, and of shadowing me, for several shifts, back-bar, until basic proficiency is achieved. Only then do the new trainees begin preparing coffee for our customers (usually after several weeks in total from the start of coffee training), and initially this is still only under close supervision from myself. This ensures a very high level of basic proficiency with all the many techniques, for all staff preparing our coffee. Even then, supervision and quality control remains continuous, as is both top-up training and fine tuning where needed, along with more advanced training as well. Then, more gradual and subtle guidance, demonstration, information, and continual quality control is given continuously over the coming weeks, months, and even years, to further progress the barista as their ability within the craft grows. After the initial, more intensive training period is completed, I don’t continue to spoon-feed lots more in-depth information and knowledge all the time. There’s little point if (even after everything that has already been offered) the interest isn’t really there. Rather, during these later stages, I think it is healthy for staff to demonstrate some initiative and enthusiasm for what they do, and do some of their own research, if they want to learn more. And if they do so, I am always more than happy to reciprocate with proportionate responses, bit by bit, whenever it seems appropriate. And, the whole time, they can also learn simply by carefully observing the many subtle details of what I do, what they do themselves with their techniques, and by continually examining the wonderful coffees that we are fortunate enough to use, and how we treat those coffees. So, if staff members take the opportunity, and develop a deeper interest and understanding of the coffee, this latter support can potentially develop and progress indefinitely. As in-house head barista and trainer, I provide this training and quality control, to an exacting standard, continuously, full-time. Obviously, this provides our staff with a completely different environment for practicing the craft, and creates a very different level of skill across the whole team, compared with places that only have occasional visits from (or to) barista trainers. Sometimes people ask HOW we achieve the level of quality that we do, as consistently as we do (especially given our sometimes extensive range of staff), and why it is so different to what you might often find elsewhere. Aside from the quality of the coffee and machinery used, and the genuine passion, obsession, and experience that I devote to what I do, the answer would be precisely this degree of continuous, full-time, in-house training and quality control, as detailed above. Oddly, sometimes people assume it sort of ‘just happens’… but in truth it is the result of continuous hard work. Genuine integrity is absolutely key as well, and is very important to me. Additionally, my role involves selecting (and very carefully managing the freshness of) all the constantly changing coffees that we use for espresso and cafetières from our top microroasters. I perform the initial dialling-in, and the subsequent continuous fine-tuning of all these coffees. I also look after all the little subtleties like most of the constant grinder adjustments (whenever I’m there myself), adjustment of different espresso brew water temperatures, and diligent machine cleanliness and maintenance. These are the other main aspects of what I constantly do at the cafe with the coffee, quietly, behind the scenes, to help it be as good as it can be. This all helps to support our baristas’ skills at varying levels, and accelerate their learning of techniques. It enables them to attempt to achieve good coffee more easily and consistently, without necessarily needing to understand all the subtle adjustments that actually allow it to happen. And so, hopefully we can offer something really special to those seeking us out, and to our regulars who already love what they find here. From when I first arrived at the plan, I implemented a wide-ranging set of simple yet crucial standards for the espresso preparation and milk texturing at the plan, which are now second nature to everyone working with the coffee at the cafe, which are trained and constantly monitored by myself, and which exceed what many other cafes have in place. Everyone grinds fresh for each shot, steams fresh for every drink, and watches and times their shots manually, rather than relying on buttons to do the job! It seems there are now always a few more experienced members of the team who will have gradually made fantastic progress in mastering even advanced techniques, and who will be flourishing – pouring some really good shots and some great latte art too! We continue to use amazing, fresh, craft-roasted, traceable coffees of the highest possible quality for both the espresso, and our cafetières as well. The cafe has invested in a great, state of the art espresso machine, and also a similarly fantastic grinder, which are impeccably maintained by myself, and which help us to get the best from the wonderful coffees we use. All these things in combination are often still relatively rare in the world of coffee. But, truly great espresso (even good espresso) is an elusive and mysterious entity, that varies from barista to barista, bean to bean, hour to hour, and shot to shot. It’s not something, even now, that I can claim to have fully mastered – quite the opposite even. The wide-ranging degree of knowledge, and the minutely fine control over every subtle detail, that some TOP baristas successfully utilise within their craft, can still make my efforts and understanding feel totally basic in comparison, which is a valuable thing to accept, and which comes only with experience. A good barista comes to understand that it’s an ongoing learning process, and that there is always more still to learn. Anyone who tells you otherwise probably knows a lot less than they think they do! With coffee, the more you learn, the less you feel you know for sure …and the more complex and fascinating the craft becomes. For me, it’s about sincerity, humility and diligence. About having a genuine appreciation of good coffee. About attempting to learn as much as you can about coffee and brewing, whilst realising there’s always more. About respecting and trying to do justice to the coffees you work with. About craftsmanship. About trying to deliver them as successfully and consistently into the cup as possible, for people to enjoy. And about communicating as much or as little about coffee and the craft as is appropriate, in a way that is taylor-made for any interested customer. My efforts with our coffee at the plan sometimes feel pretty embryonic compared to some top boutique places that are built from the ground up with great coffee in mind, and which only employ staff with the same passion. Therefore it’s not always perfect, and the quest is to always try to learn more and aim higher. I think it is fair to say however, that the standard of our coffee drinks, at their best, is at a level that we can be truly proud of. And so, all in all, the cafe is a great place to have a coffee, watch the world go by …and plan! While visiting coffee related web sites, I found your blog and e-mail address. I hope you will forgive the unsolicited e-mail. I am working with the specialty coffee industry in Indonesia. The industry here recently formed a trade group called the Specialty Coffee Association of Indonesia (SCAI). Thanks! I’ll bear that in mind. Best wishes, Trevor. I am a fairly regular customer of yours and tend to sit outside, in all weathers, with one or other of my friends from the university (I am a professor there). I love your webpage but most of all I love your coffee! Easily the best in Wales! For visitors to Cardiff, it is certainly worth hunting down The Plan to find out what real coffee is like. Congratulations on your award and your work. …Ah – a latte, right?! Nice to put a name to the face. So often I know what people drink, but little else, sadly! Many thanks for your exceptionally kind feedback, it means a lot when customers appreciate the work, and comment. Yep, Trevor! Latte and Buck Rarebit with no garnish! Hope you are enjoying the sunshine and get to see a bit of it. Yes – beautiful out on the mountains near here today …and in the garden …with some lovely coffee! 🙂 You too, I hope! Yes, sure, that sounds great! I’ll email you so we can be in touch. I’ll be in the cafe all next week, Monday-Friday and possibly Saturday, so we’ll be able to arrange to meet up no problem. Great! We will be in Cardiff on tuesday afternoon and love to make a myfirstcoffee.com film with you, if you like that!….. The aim is primarily to find the best crafted espresso beverage in the city, and it looks like you’re coming close to it! I was going to come and do a review of The Plan but thought I’d go one better and ask you: Is there any chance you would be interested in an interview and possibly some sort of video of you making a perfect flat white or otherwise? I’ve just recently got into the coffee game and I’m learning a thing or two every day. I was wondering whether you give lessons on espresso brewing here in Cardiff? I don’t provide public courses or external training sorry. I provide training for all our in house staff at the cafe only, exclusively. It’s a full time focus and commitment maintaining the standards I want for the cafe, and I simply can’t spare the time to provide other training. But I do write this blog! So there’s lots of info here which will hopefully be of some help, and there are also links from it to many great coffee sites that I have found particulary valuable and interesting. I love your passion and obsession for Coffee!! I will look your coffee shop up the next time I am in UK. I am involved in coffee myself and I only deal with Grade 1 premium coffee from Rwanda and Ethiopia ( Obviously pure Arabica). I have a team of coffee lovers ( my staff) we call them “the dream team” you are more than welcome to visit us in Mauritius on your next planned vacation!!. Look for MJ café in Grand Bay. Thanks! Sounds great, if ever I’m lucky enough to be holidaying there, I’ll be sure to come by! Hi Trevor, I appreciate your great work and thanks. I have learnt something from your article. Like you mentioned that learning abt coffee can’t be exhausted,I totally agree with you.Am a barista frm Uganda. Hi Patrick, Many thanks – glad you enjoy the blog! Kind regards. We are looking for Head Barista for coffee house speciality. Thankyou very much for the enquiry. Nice kit. But I’m afraid I am currently settled where I am. Best wishes! Hey Trevor, its Chris Barroccu here. Regular Plan customer and hufe coffee fan. I was wondering if you run training courses ? I would love to learn more about coffee and thinking of buying a fairly decent machine for home. I’m afraid I don’t; doing what I do at the cafe, and training all our staff to the standard we require, is just such a full time commitment, I simply don’t have the time to organise and run courses as well. I’m always happy to talk about coffee and techniques though, and advise as much as I can. If you’re thinking about home brewing, I would recommend researching a lot about which brew methods will best match both your needs and the level of time you’re willing to invest, and also which grinders will give you the best results for the chosen brew method.